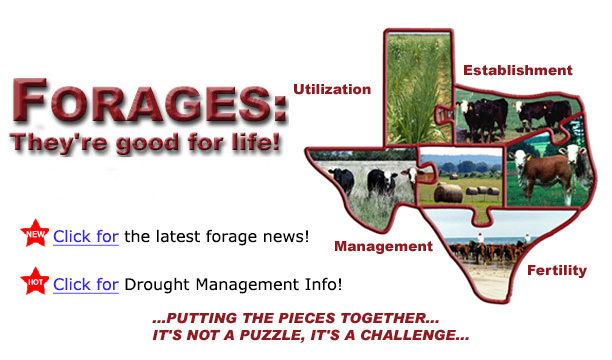 WELCOME to the Texas A&M AgriLife FORAGES website. On this site you will be able to read or download forage-related publications that will help with forage species selection, establishment, management, and utilization. There is information on soil fertility, grazing management, incorporating legumes into your forage system, and minimizing winter feeding costs. You will also find information about our Pasture & Livestock Management Workshop for Novices, how to manage forage pests, information about upcoming events, and links to other sites you will hopefully find useful. For questions or comments, please contact Dr. Larry Redmon @ 979-845-4826 .